You may have frequented the former Baton Rouge Restaurant at Toronto Eaton Centre. 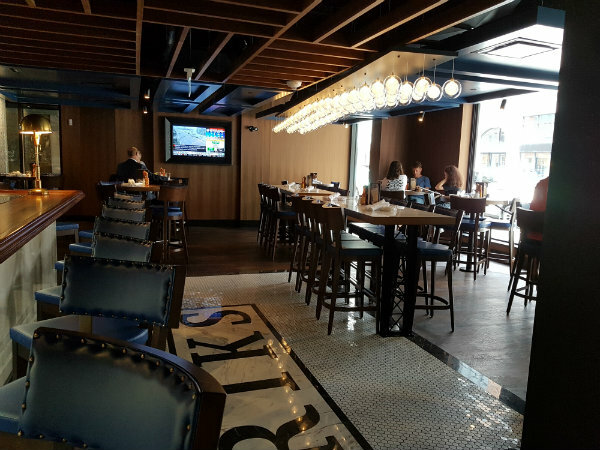 Since February of this year, Hendriks Restaurant and Bar has taken over the space, which has been completely renovated. Gone are the curtained windows and heavy red décor, and in its place is a gorgeous room, with contemporary light fixtures and sapphire blue hues. Torontonicity was invited to a menu tasting at this elegant restaurant. We arrived for lunch on a Wednesday and admired the open-air bar, with tables and chairs facing Yonge Street. 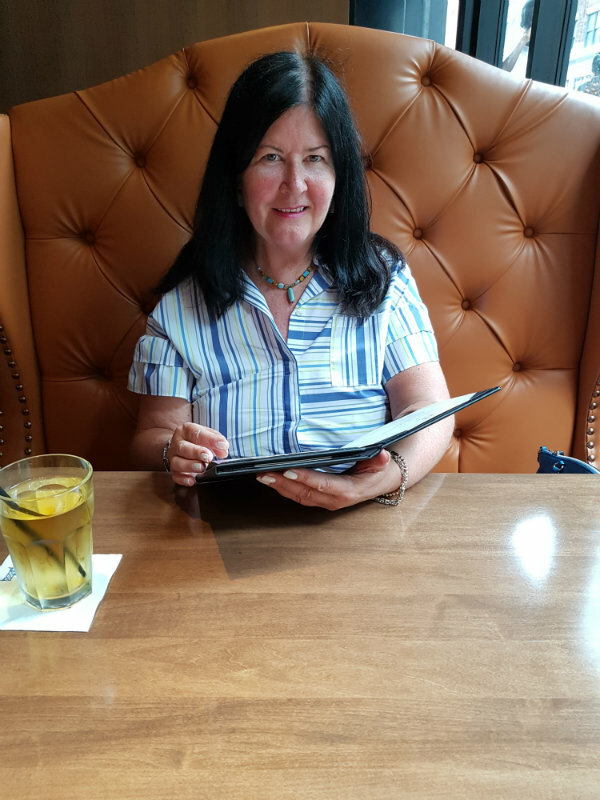 I was tempted to request a seat in the bar where the Rogers Cup was being broadcast on several HDTVs, but we were quickly seated at one of the tan leather banquettes – a much better choice. 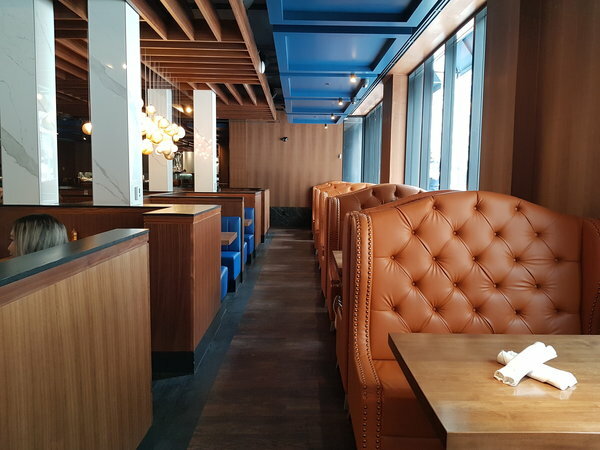 I loved the privacy and elegance that these booths offered, as well as the floor-to-ceiling windows, which gave us a people-watchers’ view of Toronto’s most famous street. Sitting at one of the large leather banquettes at Hendriks Restaurant, I felt quite regal! Our efficient server, Courtney, quickly brought us beverages and then explained the dishes on the tasting menu. We were offered Greek Tacos, $12, and Ahi Tuna Tartare, $17, to start. 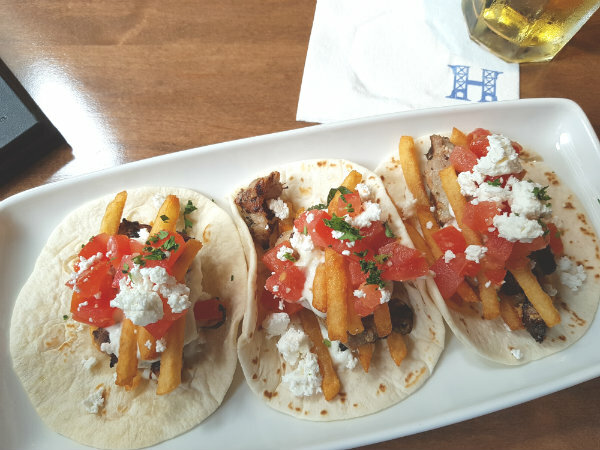 The Greek Tacos featured grilled pork, tomatoes, house-cut fries and house-made tzatziki. All the ingredients came together beautifully to create some really tasty tacos – the pork was well cooked and cooled by the creamy tzatziki. 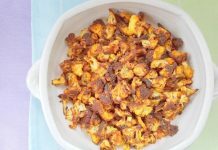 The addition of the crispy house-cut fries provided the surprise factor, elevating these tacos into a really delicious hors d’oeuvre. 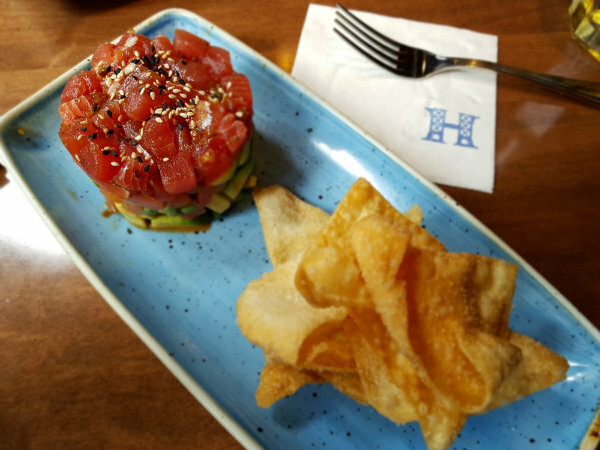 The Ahi Tuna Tartare featured raw tuna sitting on top of a bed of sliced avocado and tomato. It tasted good scooped up in crispy house-made taco chips. My dining partner and I were each allowed to choose one of the entrees on the menu: I opted for the Pan-Seared Branzino, $30, while my dining partner (my mom!) ordered the Campfire BBQ Danish Ribs, $29. I don’t generally eat pork, but my mother was raving about her Campfire BBQ Danish Ribs so I had to try one. Wow, these ribs were incredibly tender and the honey garlic sauce was delectable. 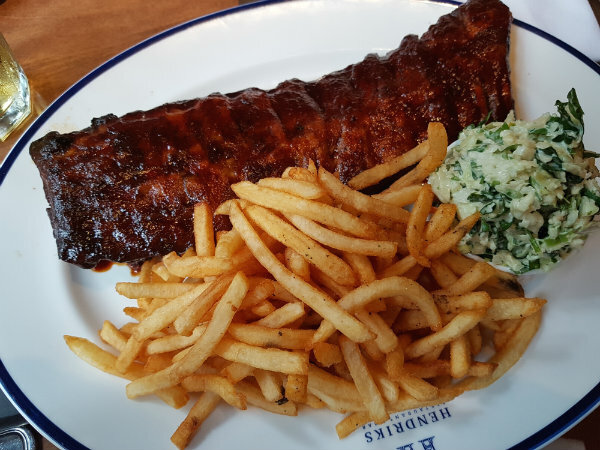 The ribs come with house-cut fries and house-made coleslaw. The coleslaw was really good – crunchy and creamy – and it appeared to contain kale, which was a different, but welcome twist. Although the fries were good, they would have tasted much better hot. 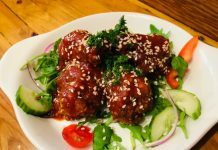 If you are a ribs fan, you must order this dish! My Pan-Seared Branzino was cooked to perfection. 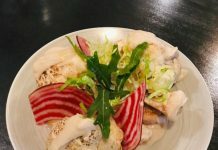 The slightly buttery-tasting sea bass requires no accompanying sauce to mask its delicate flavour. This seafood lover was greatly satisfied with this dish. 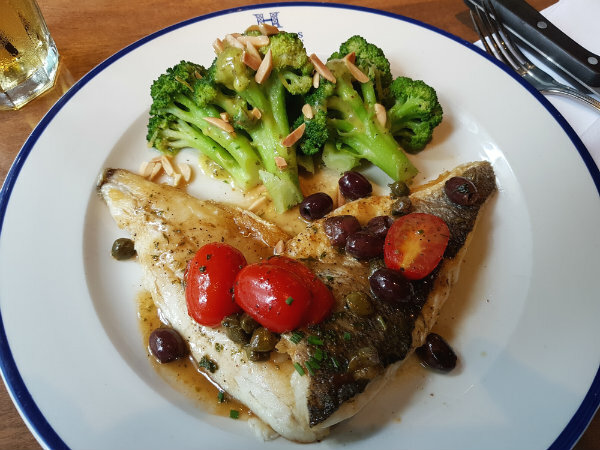 But the fish wasn’t the only standout on my plate: broccoli almandine was perfectly steamed and accompanied by a butter garlic sauce while grape tomatoes bursted with piquant flavour. 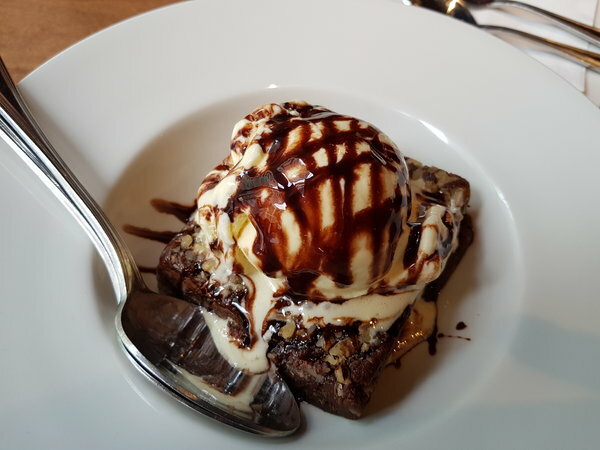 For dessert, we shared a Warm Walnut Brownie a la mode. This chocolate dessert was chock full of nuts, which balanced the chocolate’s sweetness. A sweet ending to a delicious meal. Hendriks Restaurant and Bar offers several specials from 3 p.m. to 6 p.m. and after 9 p.m. Their “The Happiest Hour” specials include Creemore or Granville for $5; $3 off wine by the glass; and $3 off select Signature Cocktails. And if you love oysters like I do, you’ll want to swing by on Thursday for their Buck a Shuck special: oysters are $1 each if you purchase a beverage per guest.